James E. Jackson III is a native of Lexington, Kentucky. He has completed course work towards the doctor of musical arts degree in euphonium performance with an emphasis in instrumental conducting at the University of Kentucky in Lexington. 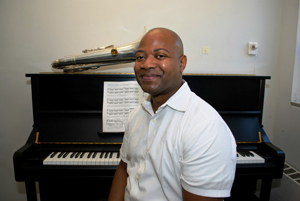 He received a master of music degree in euphonium performance in 1995 from George Mason University and a bachelor of music degree in music education from the University of Kentucky in 1993. He was principal baritone of the Lexington Brass Band and a featured soloist with the band at the Mid-West International Band and Orchestra Clinic in 1997. He has performed as a soloist with ensembles at the University of Kentucky, George Mason University, and the University of Connecticut, where he premiered Allen Feinstein’s concerto for euphonium and band,Swimming the Mountain. Jackson is a founding member of the Kentucky Horse Park Four Horseman Tuba Quartet and the Concord Tuba-Euphonium Quartet. He was a recipient of the Lyman T. Johnson Fellowship at the University of Kentucky, toured Spain as a member of the American Spiritual Ensemble, first-place winner in the 1995 International T.U.B.A. conference Tuba-Euphonium Quartet competition and first-place winner at the prestigious Leonard Falcone International Solo Euphonium Competition in 1994. He has been a clinician throughout the United States, Canada and Europe at numerous universities, colleges and public schools. In addition to his position as principal euphonium of the United States Coast Guard Band, Jackson is the music director and conductor of the Thames Valley Music School Youth Symphony Orchestra, lecturer of euphonium studies at the University of Connecticut and performs regularly with the tuba and euphonium quartet Alchemy, including annual tours throughout Northern Germany, giving solo performances and master classes, as well as conducting massed brass ensembles.